Our highly trained, courteous English speaking staff is waiting to take your call. Whatever time it takes to assist you, that’s the time you will receive. We are here to help you. For centuries, crowds of people speaking diverse languages filled the bazaars of Asia, and long caravans crept along dusty roads carrying precious gems and silks, spices and dyes, gold and silver, and exotic birds and animals to Europe. Yet the Silk Road was to become not only a great trade route but the melting pot of two very different civilizations; those of the East and the West, with their specific cultural traditions, religious beliefs, and scientific and technical achievements. Central Asia, situated between China and India in the east, bordering on the European world in the west, spreading between the Volga and Siberia in the north, and between Persia and Arabia in the south, for almost two thousand years stood at the crossroads of the world's great civilizations and cultures. Much has been lost to history. The sands of time have covered many ancient towns, but the careful hands of archeologists and restorers have succeeded in finding and restoring for us rare treasures from the old cultures of the Semirechye (Seven Rivers region) and Central Asia. Branches and routes of the Silk Route didn't remain static over the course of time - they changed for various reasons: some of them gained significance and flourished, while others ceased to exist, causing the decline of the towns and settlements in their path. In the sixth and seventh centuries A.D. the route passed through China to the west via the Semirechie and southern Kazakhstan. The flourishing period of the Silk Road through Central Asia and Kazakhstan declined during the 8th-12th centuries. The huge territory remembers the slow plodding of camel caravans, for thousands of years wandering the wide routes of the Great Silk Road. This part of the road represents a unique complex of historical monuments, archeology, architecture, town planning and monumental art. 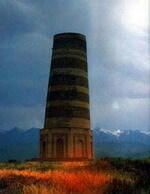 The cities of Otrar, Taraz, Sairan (Ispidzhab), Turkestan (Yassy), Syab, Balasagyn and others were not only shopping centers, but centers of science and culture. Taraz. In ancient times the town was called the 'town of merchants'. Narrow streets, like streams, ran towards the center - the noisy bazaar. The bazaar of Taraz was the focus of the city's life. It was thanks to the bazaar that the town came into being, with a citadel, mosques, caravanserais, mud-walled cottages, walled courtyards and craftsmens' workshops. It seemed that people from all over the world were coming to the bazaar in order to sell, buy or exchange something. One could sell and buy practically anything. The ancients were right to say: "Taraz bazaar is the mirror of the world". Over the course of many centuries it was a center of non-ferrous metallurgy. 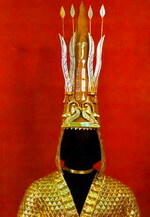 The copper articles of Taraz workshops such as jugs, cosmetic boxes, lamps, decorations for armaments, clothes and harnesses traveled all over the world. An example of casting art is the ritual teapot (Kazakh) in the mausoleum of Ahmet Yasavi in Turkestan; it is second to none in its dimensions. Its diameter is 2.2 m, and weight - 2 tons. In 1896, at the All-Russia exhibition in Nizhny Novgorod, Kazakh bracelets made of silver caused a real sensation, and they were awarded gold medals. The present-day green bazaar is on the very spot of the ancient bazaar of two thousand years ago. When you walk along its rows, you feel the dust of millennia under your feet. Otrar. "Traveler! Here are the ruins of the fortress town that stemmed for half a year the advance of the Mongol hordes to Central Asia and the Caucases, Russia and the Eastern European countries, and which showed resistance to foreign invaders in the following centuries", runs the inscription on the cast-iron plate installed on the entrance to the Otrar archeological reserve and museum. The Otrar oasis included over 150 small towns, fortresses, castles and fortified settlements, connected to one another by a chain of caravanserais of the Great Silk Road. In its heyday, the population of Otrar numbered about a quarter of a million. 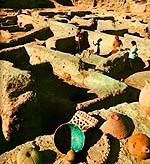 The first permanent settlement in the Otrar area is dated to the 2nd century B.C. Its founders were the Kangyus - descendants of the Saks. Otrar is the birthplace of the great scientist and philosopher of the Middle Ages, Abu Nasra ibn Mohammed who entered history under the name of Al Farabi. The thinker lived between the years 870 and 950. Thanks to his philosophical thinking and encyclopedic knowledge, he was called the Second teacher of mankind, after Aristotle, when he was still alive. His treatise on the classification of sciences opened a way for scholarship in the centuries ahead. It is natural that all the great scientists after him, such as Avicenna, Al-Biruni, Shirazee, Makhmud Kashgari, Yusuf Ballasafuni, Ulugbek, and ibn al-Farabi considered themselves to be his disciples. Turkestan. Another ancient town on the Great Silk Road was Turkestan, which is 1500 years old. The town came into being in 490 A.D. The town of Yasa saw its greates prosperity in the 7th century. At that time it was a motley, crowded maze with its abundant bazaars and endless caravans. The fame of the town spread all across the Islamic world. To a certain extent, this was due to the name of Hodja Ahmed ibn Ibragim al Yasawi, a dervish and advocate of Sufism, and the founder of the ascetic brotherhood of Yasavia which translated verses into the language of ordinary people. His poems became very popular; his ardent sermons attracted a large number of pilgrims. It was at that time that Yasa was called "a second Mecca". Sufism is a religious teaching that combines orthodox Islam and popular beliefs. In his private life and with the help of simple easily understood language, Hodja Ahmed Yasavi called upon people to be kind, meek, and obedient and not to be greedy. Ahmed Yasavi's fame did not dwindle after his death. Thousands of pilgrims thronged to his grave. 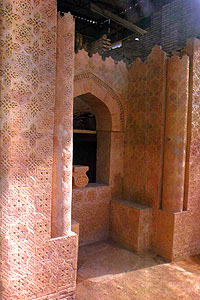 The first mausoleum built over the sheikh's grave was very modest and became dilapidated as the years passed. 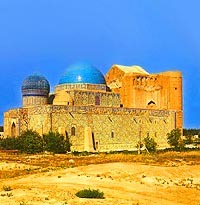 A new mausoleum was erected 233 years after his death on Tamerlane's orders. At present, Ahmed Yasavi's mausoleum has been restored to its original appearance. The town is becoming a major center of world tourism. In the time of the caravan trade existed another very important ancient town - Ispidzhab or Sairan. In the historical chronicles of the 9th and 10th centuries, Ispidzhab was called a first class military fortress. The Arabs named this town one of the best in the East for its independence and dignity, attaching the name "White town" to it. Many disasters befell Ispidzhab after the devastating wars against the Khoresmians and Kara-Chinese. There is nothing left of the fine gardens and fortifications but ruined walls, and rotten and broken trees. In the 15th century the town was restored to life under the name of Sairan, and once more it was surrounded by strong fortified walls and trenches. After its subsequent destruction in 1684, Sairam was not able to recover its former name. Currently, there are very few remains of the past fame of White town, such as the ruins of walls and bastions, the minaret of the demolished Bazalakata (12th century), a mosque with a spiral staircase and the half-destroyed entrance to a basement leading no one knows where. Some religious structures remind you of the past of Sairam, such as the two monuments connected with the name of Hodja Ahmjet Yasavi, which were built after the Dzungar invasion. His parents were buried in Ispidzhab. After the erection of the tomb to Hodja Ahmet Yasavi in Sairan, monuments were erected to his parents - Ibraghim ata and Karachach ana. Suyab and Balasagun. Suyab was the first capital of the western Turkic Kaganat, which was formed in 581 as a busy trade center. Every year merchants from different countries came to a big fair where they sold and bought goods and discussed commercial matters. 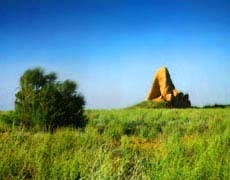 Suab was the ancient capital of the Semirechye Turks, the forefathers of the Kazakh ethnic group, and Balasagun was the first town where the Turks were first introduced to the Koran. The towns were re-ordered many times but it was rather difficult to determine their exact geopolitical positions. For about two thousand years, caravans drove along the Great Silk Road. Nothing could stop their measured steps. The world was shaken by bloody wars and devastating epidemics. Peoples and states sprang to life and then suddenly disappeared. Even the Amu Darya changed its course and sources; the Aral Sea changed its outline and only three Silk Road cities remained unchanged.